This patch is for 32 and 64-bit versions. - Copy the patch to the installation directory (IMPORTANT) and apply. - Register the program with the keygen. 21.1 MB + launcher..neni muj upload...netest..!!! Měl by ale fungovat i patch z minulé verze. 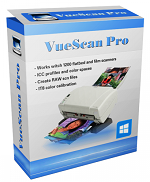 VueScan Pro 9.6.32 DC 22.02.2019 Multilingual | 21.6 Mb..netest..!! !